Who can decide the best tattoo machines (wiki) for tattoo beginners? Many people form a personal preference on the type of tattoo guns they own and can recommended to others. The Six Gun Tattoo Kit by Fancier S-T06 is one of those. Its good for both the amateur and professional alike. The Fancier S-T06 kit can be exactly the system you was looking for as a starting tattoo master. What is Inside this tattoo machine kit? The Six Gun Machine by Fancier S-T06 comes in carrying case that arrive with a lock and key. 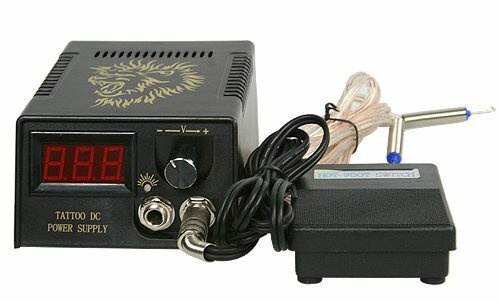 It has 6 tattoo guns, a power supply, inks, video guide for tattoo starter and many other accessories. Also, Inside the kit you will find four grips, two are rare empaistic grips, and two are stainless steel grips. The kit also comes with a tutorial video design for beginners. Those who are starting the tattoo mastery career, will be happy to see practice skin and designs. Those people who are just beginning as well as those who have been creating this beautiful art for a long time will find usefulness out of these six machines. All of the guns are designed with a steel frame and run on a low temperature. There is also a tattoo gun with a bronze finish for a different look. The set comes with eight stainless steel tips of different sizes. Four of which are round needles and the other four are flat or magnum needles. All the guns can be set up to perform as a liner or shader. The professional power supply is able working with either an 110v or a 220v. The company that creates this kit will send the plug pre fitted with the power outlet plug from your specific country. The power supply comes with the ability to control it through the foot switch. Many people have decided that the power supply is something you might want to upgrade if you use the tatoo machine often and going to a pro level. However, this power supply will offer about 10 hours of tattooing ability. The tattoo machine kit comes with seven different ink colors. The tattoo ink sets come with one bottle of each of these colors brown, blue, red, yellow, green, white and black. The inks are designed for a new artist in the tattoo business. The inks are great for learning how to use the guns and such. However, if you plan to tattoo more professionally, you will need to get better inks. You will also receive an ink holder with your kit. The buyer also receives a DVD that’s designed to help those who are just learning or beginning to tattoo. Also, in this kit, a person will discover 18 different disposable tips, 50 tattoo needles both liners and shader needles. 10 rubber rings, 50 rubber bands, 50 grommets, adjustment tools and other accessories. 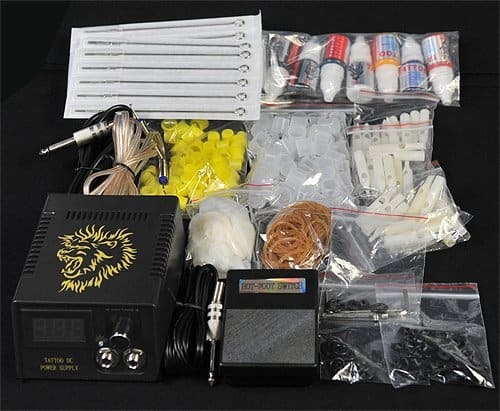 All you will need from a professional tattoo kits. Fancier S-T06 Gun kit is a great set for those that are beginning or needing to replace an entire set due to theft or mishap. 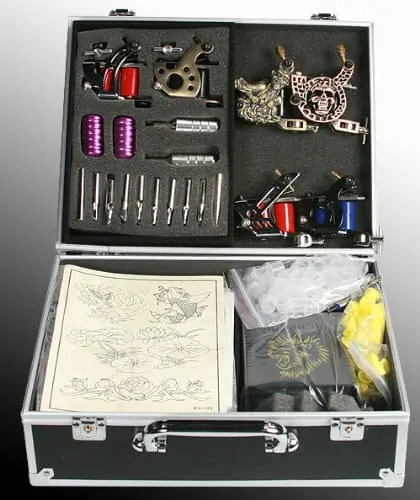 Typically, you cannot buy a quality tattoo machine for less than $150 and many run as high as $500 but here your receive a fairly fast kit, and its the complete set to start off tattoin, with instructions DVD, 6 guns, inks, stencil and much more. You will want to purchase more ink because you are only given one bottle of seven different colors. It is worth the cost to receive only the six guns, and with all the accessories, it is great a bonus. Anyone who tats out of their house or even in a shop, I recommend this to you. Start becoming a tattoo artist you always wanted to be.